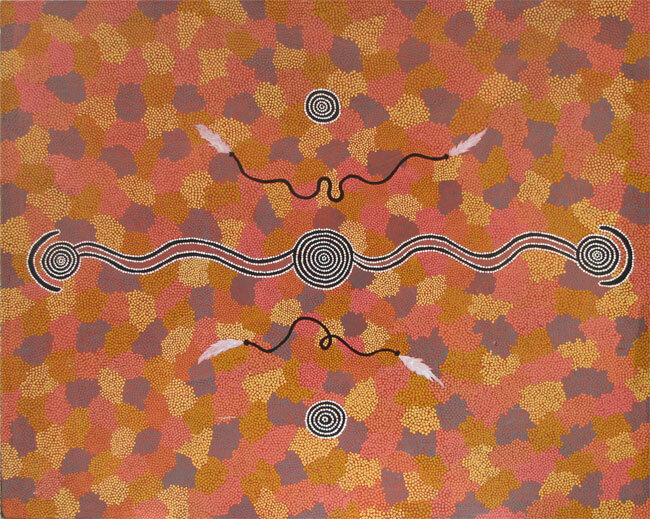 The subject of this painting is the Yuelamu Honey Ant site on Mount Allan Station, a part of the huge journey of the honey-ant ancestors, and linked with Papunya, Ngarlu, the Yuelamu site, and Yuendumu. At Yuelamu, two mythical women began to dig for honey ants, unbeknown to each other as they dug deep into the ground. They finally met each other under the surface, simultaneously striking each other dead as they struck out with their digging sticks. 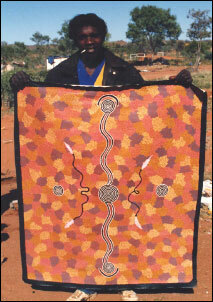 The three circles represent the two holes where the women commenced digging, and the third, at the centre, where they met. These are now the three rockholes at the Yuelamu site. Also shown are hair-string belts, used by the women when recreating the story in ceremony.